In recent years there has been a surge in barn finds, with all sorts of expensive vehicles, including Ferraris, Maseratis, and Bugattis, discovered after spending decades in storage. The vehicle pictured above is not on the high-priced side of the automotive industry, but it’s definitely one of the rarest race cars you can find in an old, forgotten garage. How rare it is? Well, it’s actually unique, because it’s the original prototype version of a race car that Frank Costin and Roger Nathan developed in the 1960s. For the uninitiated, Frank Costin was an automotive engineer who advanced monocoque chassis design and is considered instrumental in adapting aircraft aerodynamics for automobile use. He worked for Lotus and designed many bodies for sports and Formula One cars. His brother, Mike, founded Cosworth together with Keith Duckworth. Roger Nathan, on the other hand, was a prominent figure in British racing scene between 1961 and 1970, driving for Brabham and Lotus, among other makes. Back to our vehicle in question, it was built and raced with considerable success in between 1966 and 1968, scoring two overall wins, five class wins, and four podiums in 19 events. In 1967 it was raced at the 24 Hours of Le Mans, where it failed to finish. The car reportedly spent its last 45 years in a garage, being unearthed after its owner, who purchased it in 1967, died. H&H Classics sold it for over £81,224 (about $107,000) in July, significantly more than the original estimate £25,000 to £30,000 (around $32,900 to $39,500). Although it’s in dire need of a restoration, the car appears to be complete and it comes with an iconic Hewland MK5 gearbox and Ford-sourced Twin-Cam engine in pieces. “It is an amazing restoration project and a true ’barn find’ slumbering in the late owner’s garage for the last 45 years. This is quite a special car. It is the original Works Prototype as driven with success by Roger himself in ’66. I’m probably dewy eyed having raced one quite extensively in the 60’s. From a personal angle, the car is an Imp-engined GT was a delight to drive, very quick in its class with neutral handling and my car did the Targa Florio, the Montjuich 12 hours and an event at Anderstorp in Sweden without any mechanical problems whatsoever," said former race driver, John Markey, who runs the H&H Classics Hindhead Surrey operation. Granted, £81,000 is not a lot of cash for a 1960s race car with some pedigree and success on the track, but the low sticker comes from the fact that it has been sitting unrestored for more than four decades. Also, while both Costin and Nathan have been at the top of their leagues back in the day, the Costin-Nathan brand doesn’t mean much when compared to Lotus, Ferrari, or Jaguar. On the other hand, this car is extremely valuable to classic racing enthusiasts, especially those that appreciate the golden era of motorsport when the big companies were challenged by small privateers, often referred to as "Garagistas," such as Costin-Nathan. And, even though it lacks the brand cachet of other racing stables from the 1960s, this car right here can brag about defeating a handful of Lotus racers and even a Ford GT40 on Britain’s most legendary tracks. This prototype is definitely worthy of a professional restoration and entries at events such as the Goodwood Festival of Speed. 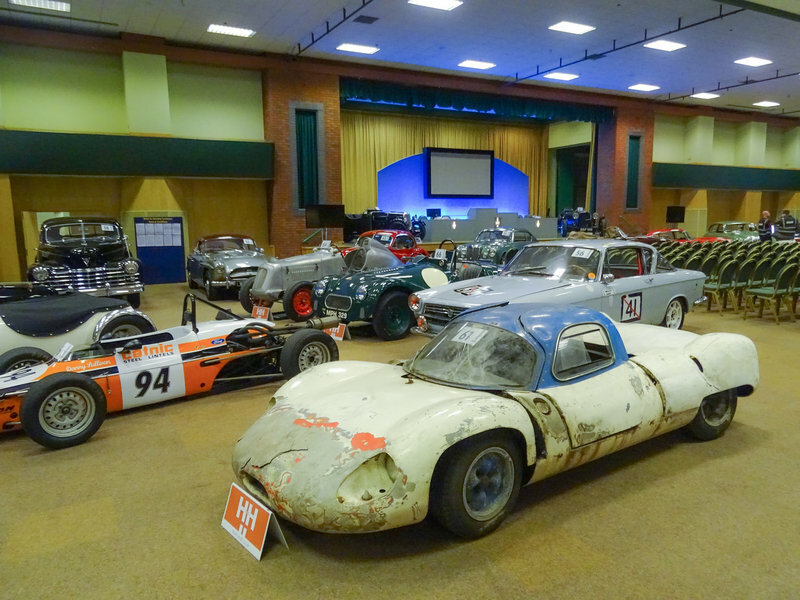 A dilapidated ‘garage find’ example of a rare car that burst onto the 1960’s racing scene – a Costin Nathan – was sold by H&H Classics at their Chateau Impney sale on Sunday July 10th for over £80,000. It had been estimated to fetch £25,000 to £30,000. The car emerged from its 45-year slumber when a Manchester company carried out a house clearance. Racing as both a Spyder and GT in the 1960’s, the two-seater now requires total restoration. Appearing to be substantially complete, it comes with a highly prized Hewland MK5 gearbox and Ford-based Twin-Cam engine in pieces. Despite its short career, the Costin-Nathan proved to be a very capable racer. Surviving examples showcase Costin’s unique talent for designing lightweight and very aerodynamic racers. The car is the original Works Prototype as raced with considerable success by Roger Nathan in 1966. Bought by the previous owner (deceased) on 6th January 1967, without the initial Imp engine, it was given a Twin-Cam powerplant coupled to a Hewland Mk 5 transmission. The driver was to be Chris Meek and the car was further modified with a hard-top to allow it to run as a GT. A large folder of correspondence charts the trials and tribulations of the next three years which added but a single class win at Snetterton in May 1967 to the two-seater’s impressive racing resume.